This quiet, traditional one bedroom apartment has everything you need. Comfortable decor located within the beautiful surrounding of Auckland's Four Star Heritage Hotel. With two pools, two gyms and fine dining this is a great opportunity to treat yourself. Smart TVs - 50" Sky TV in the living room and 40" Sky TV in the bedroom Full cooking facilities, fridge freezer, dishwasher, air-conditioning and heat pump. FREE UNLIMITED WIFI. CAR PARKING AVAILABLE ON REQUEST. Short walk to restaurants, cafes, bars, art galleries, museum, theatre, markets, parks, swimming pools, shopping, trains, buses and ferries. We will meet you on arrival and show you around the apartment. We're happy to answer any questions you have about the local area. You’re going to want it special; your anniversary weekend away, or that long anticipated event that you just can’t miss. No hiccups, or hassles, just a great evening or couple of days away that will live up to all your expectations. That’s where Toodle comes in. We make sure that your accommodation is just as memorable as the event. We’ve seen all the properties we manage and ensure that they’re pristine, with fresh linen on the beds and a Toodle welcome pack of essentials. And if you want flowers, breakfast, airport pick-ups or practically anything else we can help with that too – just Toodle it! Our aim is to make sure you have the best stay possible. If there is anything you need during your stay please let us know by texting or emailing. We respond to requests from 8am to 8pm every day. Only 5 minutes walk the buses, trains, ferries and airport shuttle. There is a coin operated washing machine on the same floor. Laundry powder sachets are provided. There is a coin operated dryer on the same floor. There is also a drying rack in the apartment. Parking is available, please inquire for rates. There are 2 gyms available, one on level SP of the hotel and then a second gym on the 2nd floor of the Heritage Towers. There are 2 pools available, a rooftop pool on level SP of the hotel and then a second pool on the 2nd floor of the Heritage Towers. The hot tub is on the 2nd floor of the Heritage Towers. Great location, super clean, comfortable bed and all the amenities. Check out the roof top pool area!! Good location, clean apartment, furnishings need an update. The Toodle staff is attentive and efficient. 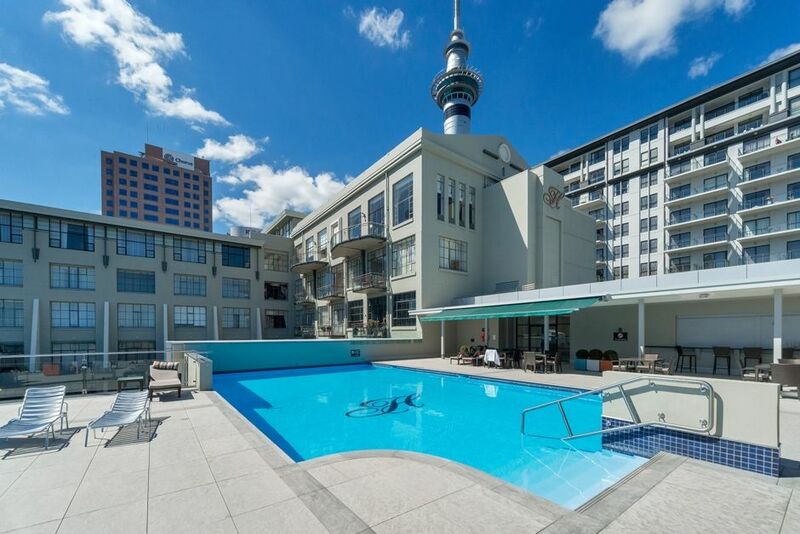 The apartment is very clean, quiet, and well-located in CBD Auckland. The use of rooftop pool and deck is a definite plus in summertime. The only drawback is that living room furnishings need an upgrade. If that is not an issue for you, go for it! A spacious place and a super convenient location. Gorgeous accomodation with access to everything the Heritage has to offer. Gorgeous accomodation with access to everything the Heritage has to offer. So central to everything in the city! Would definitely stay here again! Very well situated apartment, central to everything!